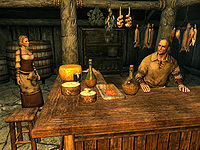 Wilhelm is the Nord innkeeper of Vilemyr Inn in Ivarstead. Upon raising Wilhelm's disposition, he will become a potential candidate for marriage. Wilhelm wears standard barkeep clothes with some shoes. He wields a leveled dagger (up to elven quality), and carries a leveled gem and a selection of common items and gold. As you enter the inn, he may call out: "Welcome to the Vilemyr Inn. If there's anything I can get you, just let me know." When greeted, he'll mention High Hrothgar: "We don't get many visitors through here, unless their [sic] headed up to High Hrothgar of course." He'll also offer you normal innkeeper services: "Need a room? Maybe a drink? You name it." or "Let me know if I can get you anything." He'll also mention the barrow near town: "If I were you, I'd keep away from the barrow on the east side of town... it's haunted." Like most Ivarstead residents, you can question him about High Hrothgar: "The Greybeards are a solitary lot. I don't think they've ever ventured outside their monastery. We get the occasional pilgrim passing through here on their way to the summit, but almost all of them have returned disappointed." If you ask him where you can learn more about magic, he'll show his distaste for wizards: "I've got no interest in magic users. No use for their kind at all. They're way up north in Winterhold, and that's fine with me. I don't even like our Jarl havin' a court wizard." During Under the Table, Romlyn Dreth will give you some smuggled Black-Briar Mead to deliver to Wilhelm. If you choose to bring the mead to Wilhelm, you can tell him you have his mead, which will grant you an anxious response: "All right, pipe down. You want the whole blessed place to hear you? The arrangement called for a trade. I hope you'll find this suitable." When exiting conversation, he'll tell you: "If you're headed up to the monastery, watch your step... it's a long way down." or "If you pass through again, stop by for a drink." "What's the point? I'm not very good, and it's only for the same few people every night." Wilhelm: "I think you should continue with your performances." Lynly: "What's the point? I'm not very good, and it's only for the same few people every night." Wilhelm: "I think you play beautifully. It would be a shame if you stopped." Lynly: "All right, Wilhlem. I suppose it's the least I can do for you." Lynly: "I think I saw it again. That... ghost. It was over by the barrows." Wilhelm: "That thing's evil, Lynly! I told you to keep away from there!" Lynly: "I'm sorry. I was curious... I didn't believe the stories. I won't go over there ever again." Wilhelm: "See that you don't. I promised to keep you safe and I'm not going to break my word." If you ask about the barrow he mentioned earlier, he'll warn you: "There ain't much more to tell... they're haunted and you should stay away. Look, I've seen one of the spirits with my very own eyes. When it glared at me, I swear it burned right through my soul." When you ask if the spirits wander into town, he'll tell you: "Fortunately, they seem to be sticking to the barrow. I think they're guarding it. Certainly isn't helping my business any; who'd want to rent a room anywhere near a haunted barrow?" If you tell him you can't help him, he'll say: "Don't blame you one bit." If you offer to help, he'll say: "If you think there's anything you can do, be my guest." You can now ask him if anyone has ever ventured into the barrow before: "About a year or two ago, some fella named Wyndelius came through; said he was some kind of a treasure hunter. I warned him not to go in there, just like I warned you. The very next night we heard screams from the barrow, and that was it. We never saw him again." Once you bring back Wyndelius's Journal, he'll be shocked: "Let me see that! ...I can't believe this... It was all just a fabrication of this Wyndelius character? I can't believe we were so stupid. Well, least I can do is give you something for taking care of him. If you won't accept it as a payment, consider it a gift." He will then give you the sapphire dragon claw, an item needed to explore the barrow further. During The Straw that Broke, Narfi will send you to look for his sister, Reyda, and will mention that Wilhelm told him that she is coming back soon. You can now ask Wilhelm about Narfi: "He's harmless. He's been in a state ever since his sister Reyda disappeared over a year ago. He just keeps to himself in what's left of his folk's farmhouse across the river." When you mention he told Narfi that she is coming back, he'll say: "I just said that to make the poor guy feel better. I'm pretty sure she's dead. Reyda would gather ingredients from the small island in the river east of here. Then one day, she just vanished. I tried to look for her, but she never turned up." If you ask if there is anything dangerous on the small island to the east, he'll warn you: "I've seen some sort of a cave entrance over there. Folks call it 'Geirmund's Hall,' but I don't know why. Probably best if you avoid it for now... it didn't seem to do Reyda any good." He will then mark Geirmund's Hall on your map. If you bring him the news of Reyda's demise, he will respond just like Narfi (see bugs). A note from Wilhelm, entitled An Apology, can be found on the counter in the Pawned Prawn in Riften. 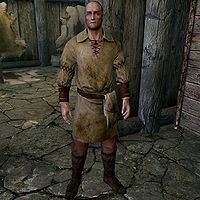 It is addressed to the store owner, Bersi Honey-Hand, and is a letter apologizing because he refuses to go into Shroud Hearth Barrow to obtain valuable trinkets since he thinks the barrow is haunted. Gwilin: "There's much more to worry about in life then a bit of a temper, my friend." During The Straw that Broke, if you show Reyda's necklace to Wilhelm, his reaction is exactly the same as Narfi's, but is voiced with Wilhelm's voice: "Reyda! You saw Reyda? Did you tell her Narfi cries? Did you tell her Narfi never said goodbye like mother and father?" This page was last modified on 8 April 2019, at 08:51.